Arsenal did just enough to get a first Premier League win under new manager Unai Emery at the third attempt. The Gunners came from behind to beat West Ham 3-1 on Saturday, with the help of a fortuitous own-goal. After a dissapointing start to their new season, Arsenal lost their opening two fixtures against defending champions Manchester City and Chelsea in the second. However, Emery gets his first taste of victory as the Gunners eased past Pellegrini's West Ham at the Emirates on Saturday. West Ham opened the scoring after Brazilian playmaker Felipe Anderson and captain Marko Arnautovic exchanged passes down the left before the Austria striker unleashed a 20-meter shot that beat Arsenal goalkeeper Petr Cech in the 25th minute. The visitors' lead didn't last long as right back Hector Bellerin broke free from West Ham's defense and ran toward the byline. He whipped in a cross that flew past several Arsenal players in front of goal, but the ball fell to the unmarked left back Nacho Monreal who slammed it past keeper Lukasz Fabianski in the 30th minute. Arsenal got some good fortune in the 70th minute when West Ham failed to clear and Aaron Ramsey headed the ball back into the area. It fell to substitute Alexandre Lacazette, whose attempted cross ricocheted off Issa Diop's chest for an own-goal. "Their second goal was a little lucky," Fabianski said. "Some details can cost you the game, but we can be pleased with the performance. With a bit more work and belief in what we are doing we can improve and do better." It was the stroke of luck Emery was searching for as Arsenal struggled to control the game and looked defensively frail. Substitute Danny Welbeck sealed victory in stoppage time, when Bellerin found him unmarked in the area. The England striker was able to turn and spin before leaving Fabianski little chance. Arsenal lost its first two matches this season, albeit to tough opponents Manchester City and Chelsea, and questions were being asked about whether the new manager was good enough to motivate his players. Emery is hoping his squad grow accustomed to a new possession-based system, but the Gunners have had a hard time adapting after the Spaniard took over from Arsene Wenger. Ramsey said it was a difficult match for him, since it was his first full 90 minutes this season, and for the team as a whole because Emery's philosophy is a "new process." "We are progressing every game. It was open at times, but I am glad we got a win," the Wales midfielder said. "He (Emery) wants us to press high up the pitch." Arsenal frequently gave the ball away as the team tried to build from the back at the Emirates Stadium. But as soon as Arsenal went ahead, the home side seemed more at ease, bounding forward with the free-flowing football it used to be known for. Emery dismissed reports that Mesut Ozil was dropped because of an argument between the pair at the training ground. "It's untrue," the manager said. "I don't know who started telling you this information. He was sick yesterday." Emery said Ozil had a cold and that he felt better Saturday and watched the match. West Ham slumped to a third consecutive defeat under new manager Manuel Pellegrini. There might be more bad news after Arnautovic limped off in the second half, with Pellegrini saying he picked up a muscle injury. But Pellegrini took positives from the match, saying it was an improvement compared to the losses against Liverpool and Bournemouth. "I am very unhappy with the result but very happy with the performance," he said. "We need to add points. But I think in every game we've proved a little bit more." After failing to convince Premier League rivals of the need for VAR, Manchester City has contributed more evidence why the technology is needed. But it came at the cost of dropping two points early in its title defense. 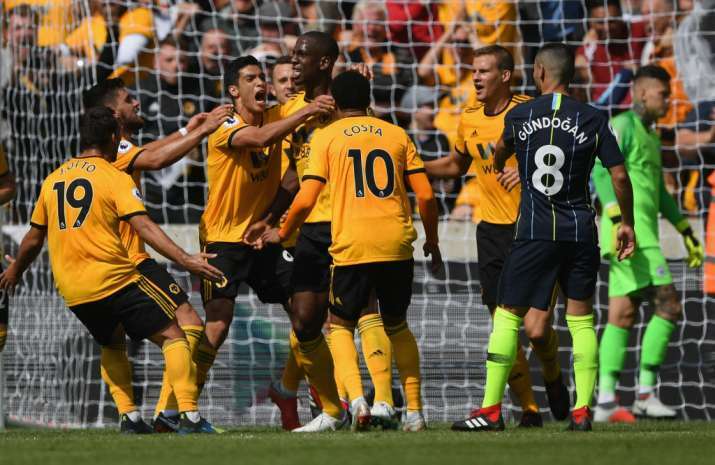 The champions fell behind at Wolverhampton on Saturday when Willy Boly used his arm to divert the ball into the net when attempting to meet Joao Moutinho's cross with a header. That was clear from the replays but England is the only major European league that has yet to allow referees to defer to a video assistant referee for a second opinion. With City at least recovering to draw 1-1 — through Aymeric Laporte's header — City manager Pep Guardiola kept his cool. "I don't work for the Premier League," Guardiola replied when asked if VAR would have made a difference. While City backed the introduction of VAR, it requires at least 14 of the 20 clubs to approve any changes in the Premier League. And when it came to a vote in April, the majority of clubs determined that further improvements were required after advanced testing this season. So a VAR at the Premier League's London control room is likely to have reviewed whether either Sergio Aguero or David Silva should have been awarded penalties for City at Wolves. But that information isn't fed to the referee yet. "I'm not the referee, never will be," Guardiola said. City now has seven points from a possible nine. 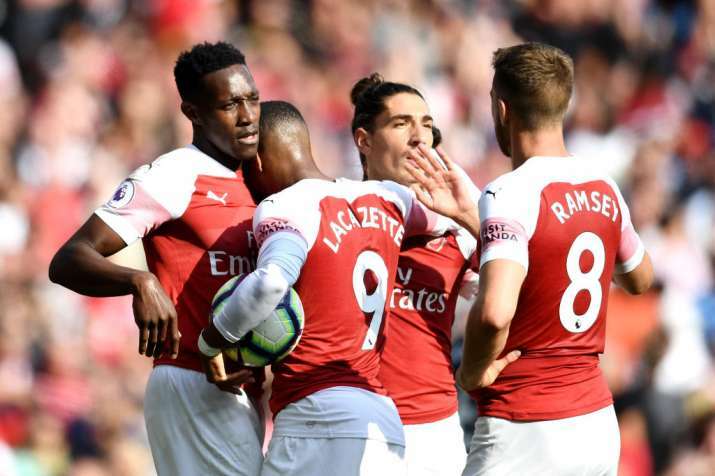 Arsenal has its first victory under Unai Emery at the third attempt, beating West Ham 3-1. Cardiff, Huddersfield and Southampton remain winless like West Ham. Harry Maguire scored in stoppage time to give Leicester a 2-1 win at Southampton. Huddersfield and Cardiff drew 0-0. Both Bournemouth and Everton had players sent off as they drew 2-2.